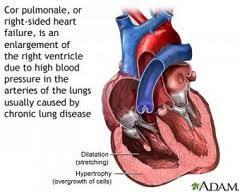 Following disorders predispose to Cor pulmonale or right heart failure. 1. Disease of the pulmonary parenchyma. 2. Disease Of pulmonary vessels. 3. Disorders Affecting Chest Movements.